Geeky Mac is your “geeky” source for the latest Mac news, technology, tips and tricks. MONTREAL — Feb. 16, 2012 — Matrox® Video Products Group today released a software update for the entire range of Matrox MXO2™ I/O devices and the new Matrox Mojito™ MAX™ card that adds broadcast monitoring support with the recent Final Cut Pro® X 10.0.3 update. Broadcast monitoring in Final Cut Pro X 10.0.3 allows video and audio output to a variety of external monitors and other equipment using the SDI, HDMI, or analog video outputs from Matrox products. Not only do Matrox I/O products provide broadcast-quality input and output, they also let users deliver H.264 files for the web, mobile devices, and Blu-ray up to five times faster than software alone, without sacrificing quality. Other important features include 10-bit hardware scaling, inexpensive HD monitoring with the exclusive Matrox HDMI Calibration Utility, and 5.1 and 7.1 surround sound monitoring using professional connections. The full range of Matrox I/O products is available through a worldwide network of authorized dealers starting at $449 U.S. (£338, €382), not including local taxes. Open public beta software release 3.0.1 for Mac, with support for broadcast monitoring in Final Cut Pro X 10.0.3, is now available from the Matrox user forum. 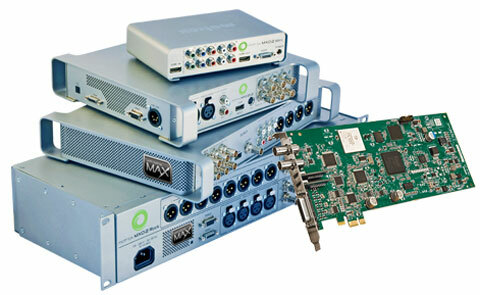 Matrox Video Products Group is a technology and market leader in the field of HD and SD digital video hardware and software for accelerated H.264 encoding, realtime editing, audio/video input/output, DVD/Blu-ray authoring, streaming, A/V signal conversion, capture/playout servers, clip/still stores, and CGs. Matrox’s Emmy award-winning technology powers a full range of content creation and delivery platforms used by broadcasters, post-production facilities, project studios, corporate communicators, videographers, and A/V professionals worldwide. Founded in 1976, Matrox is a privately held company headquartered in Montreal, Canada. For more information visit www.matrox.com/video. © 2006 - Geeky Mac. All Rights Reserved.